Coraopolis Youth Creations is hosting a Back to School Bash on Saturday, August 11 from 12 pm - 3 pm at Bliwas Field. There will be entertainment, games, and free food. Backpacks will also be handed out at the conclusion of the event! See attached flyer for more details. Cornell's 8th grade is hosting a fundraiser on Tuesday, October 23rd at Chipotle in Robinson from 4-8 PM. Tell the cashier you are there to support Cornell's 8th grade trip to DC and a portion of your dinner costs will go to benefit the students trip! See you then and thank you for the support! The Cornell School District is partnering with the Coraopolis Library to offer a summer reading and math passport program. Please see the attached flyer for more information! Welcome back Cornell students! First student day will be Monday, August 27. If anyone has questions pertaining to bus stop information please click on "Parents" tab and then click on "Transportation." See everyone Monday morning! Ciara White McShane was recently selected as a TIP scholar during Duke University's 38th annual 7th grade Talent Search. 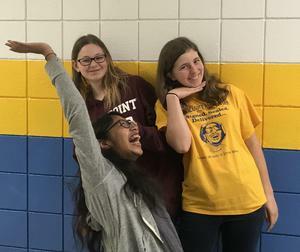 This program helps gifted seventh graders develop their abilities and identify the extent of their academic talent through above-level testing (click on the title to read more). Congratulations to Mrs. Robin Heigley, 1st-grade teacher, and Mr. Larry DiSilvesto, high school technology education teacher for being nominated to be Keystone Technology Innovators. The Keystone Technology Innovator program is organized by PAECT. Each principal can nominate one individual for “outstanding classroom technology innovation." Once nominated, teachers have the opportunity to become 1 of 100 “Keystone Technology STARS” and participate in a week-long summit this summer. In past years high school science teacher, Mr. Tavis Bogue, and Dynamic Learning Project Coach, Mrs. Rachel McVeagh, were selected as STARS. Good luck Mrs. Heigley & Mr. DiSilvestro. Congratulations to high school teacher, Mrs. Amy Palo, who was recently selected as a James Madison Memorial Fellow. The James Madison Fellowships were created to honor Madison's legacy and Madisonian principles by providing support for graduate study that focuses on the Constitution, its history and contemporary relevance to the practices and policies of democratic government. Mrs. Palo will receive up to $24,000 to pay for her master’s degree in American History. Next summer, Mrs. Palo will be studying at Georgetown University. Please click on the link for information about this workshop.